Because of its high rainfall, the South East is one of South Australia’s major agriculture and horticulture districts. The SA Department of Agriculture has had staff and an office at Mt Gambier for more than a century. Initially, Mt Gambier based Department of Agriculture staff operated from their homes. The first officer appointed in the Mt Gambier district was Mr Rodney Fowler. He acted as a part time Orchard and Garden Inspector between January and March 1908, and was then appointed full time to this position on 9 November 1908. Although he initially lived and operated from Coonawarra, he relocated to Mt Gambier in 1910-11, concentrating on activities in the Coonawarra, Mt Gambier, Naracoorte and Penola districts. His early work focussed on inspection and quarantine services associated with fruit fly, codlin moth, phylloxera and other major pests, chaff quality, and registered fertilisers and chemicals. Over time, the role evolved to include certification of potatoes (over 33,000 bags of seed potatoes approved in 1913-14) and other crops for export interstate, research into new pests such as curculio beetle, evaluation of new potato varieties, and delivery of horticulture advisory services from Bordertown to Port Mac Donnell. In 1916-17, he was covering much of this extensive region on a motor cycle. In 1918, Mr Fowler moved to the role of Manager, Blackwood Experimental Orchard, and was replaced by Mr John Harris, who held the South East position of Orchard Instructor and Inspector. In September 1920, Mr Harris transferred to this position for Northern Districts (Clare, Barossa and mid north) and was replaced by Mr Hector Orchard. 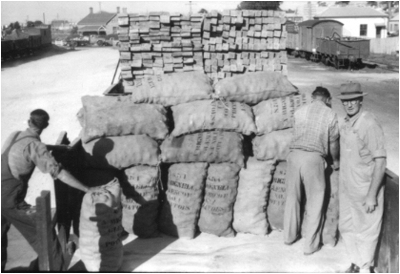 Loading potatoes into rail trucks at Mt Gambier, May 1959. Horticultural Inspectors have played a key role in facilitating export of produce from the South East region. Mr Orchard served as the South East Horticulture Instructor and Inspector for 14 years, when he was transferred to the Southern District (south of Adelaide) to replace a retiring Mr C.H. Beaumont. Mr A.L. Warren replaced Mr Orchard as the South East Horticulture Instructor in February 1934. An important role during the 1920’s and 1930’s was assisting WW1 Soldier Settlers as they developed their properties. Alternate crops like chicory (Rendelsham) and tobacco (Yahl and Kalangadoo) were also important to the South East during this period. Delivery of services to grain and livestock industries were focussed from Kybybolite Research Station (rather than Mt Gambier), and commenced with appointment of the Superintendent of Agriculture, South East to Kybybolite in 1909. Prior to 1950 the Department of Agriculture did not have a dedicated office at Mt Gambier, and services were delivered to the farming community from officer’s homes. The Mt Gambier office was established as a major service centre in about 1950, and significant expansion of staff numbers occurred through the 1950’s and 1960’s. It continued as a major centre until the late 1970’s when the South East Regional Headquarters were established at Struan in 1979. This resulted in some decline of importance of the Mt Gambier office. District Agronomist and field officers serving the grains and small seeds industry. District Horticultural Adviser and Horticulture Inspector (export produce inspection and potato/vegetable seed certification). In about 1950, an office was established in a hall at the rear of the Church of Christ on Bay Road. From 1968, the office was located in the old Savings Banks of SA building on the corner of Bay Rd and Helen St. This building was cold and damp with poor lighting. The 1976, the move to the new SGIC building in Helen St was a welcome one. In 2000, the office was moved to the Woods & Forests Dept headquarters building on the Jubilee Highway at Mt Gambier East. From 2004, the office was located at Krummel St.
Post WW2 Soldier Settlement programs. Dairy Quality Improvement Program to improve quality of cheese for export (following loss of the Japanese market in the late 1960’s). This involved improved on-farm milk handling, effluent disposal, dairy shed design and rationalisation of dairy factories, and introduction of a training and TAFE Rural Studies Certificate to which many Department of Agriculture staff contributed. Technical support for the pea, sweetcorn and vegetable freezing industries in the 1950’s to 1970’s. Establishment and operation of a potato crop monitoring service for the frozen French fry industry (1990’s). Development of pyrethrum production and early stage processing. Technical support during the development of a regional apple industry by Joyson Orchards in the 1980’s. Assistance with introduction of new hortiultural crops including lemons, walnuts, herbs for oil extraction and kiwifruit. Certification of export onions, export pasture seeds and certified seed potatoes. A weekly column in the Border Watch newspaper. A weekly live half hour TV program “Down to Earth” broadcast on Channel 8. Crop monitoring service for processing potato growers. Farmer discussion groups for local problem sharing. 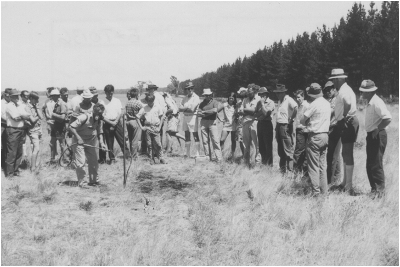 Skeleton Weed field day, Penola 1971. Prepared by Mr Barry Philp with contributions from Mr Wilf Bowen and Mr David Moss.